Happy Easter 'Fetti Fans! 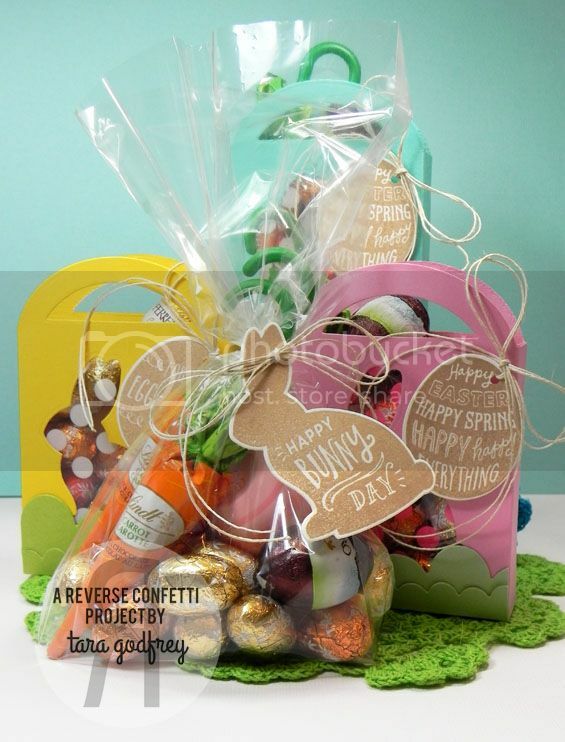 Just hopping by to share a few Easter Tagged Treat Totes that I made with my Reverse Confetti Stamps and Confetti Cuts. I picked up some pretty polka dot transparency paper the other day at Michaels and thought it would be cute to use it for a little bunny window in the Tagged Treat Tote. I cut the totes from Lemon Drop, Grapesicle, Pink Lemonade and Blu Raspberry and then used the bunny die from the More Than Jellybeans Confetti Cuts to cut out the opening in the front tote panel, adhered the transparency and then fully assembled the tote. I added some grass cut with the Wonky Double Edge Scallop Border Confetti Cuts from Gumdrop, Spearmint and Sour Apple Heavyweight Cardstock. Finally, I stamped several of the egg sentiments from the More Than Jellybeans Stamp set and on Whip Cream Heavyweight Cardstock with Kraft Premium Dye Ink. I punched a whole in the eggs and tied it with Hemp cord. I also filled a cellophane baggie with some treats and an EOS Coconut Milk lip balm that I thought looked like a cute little pink egg. I tied the bag with more hemp cord and made a little bunny tag that flips open to write a note inside. 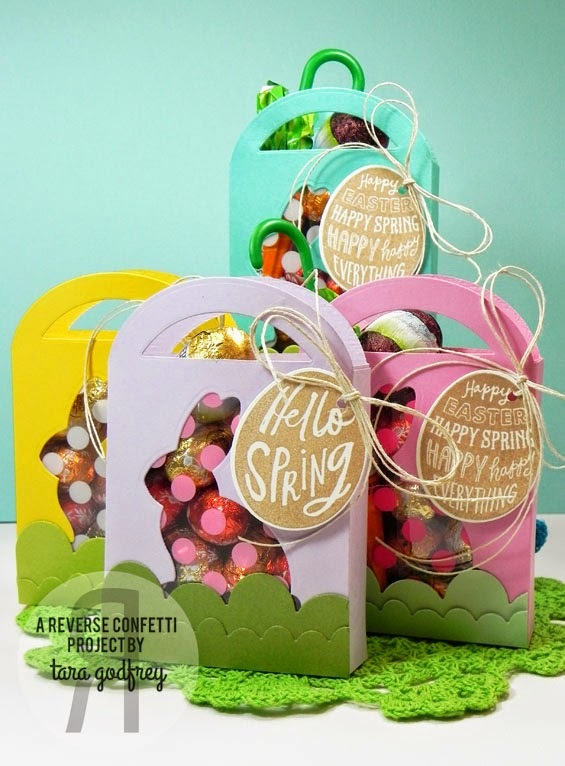 Thanks for stopping by and having a little look at my Easter Tagged Treat Totes with the More Than Jellybean Stamps and Confetti Cuts! Happy Easter, Happy Spring, Happy, Happy Everything! Sooo sweet! Love all the golden eggs.